Olivier opts for a very literal interpretation of the scene, done completely in voice-over, showing Gertrude's story as fact. In the restructuring of the play, we go directly from Ophelia's madness scene to the suicide, though the literalism turns it into an accident. The camera struggles to follow her out of doors, and turning the corner, finds she's gone. But the brook is in the background outside the next doorway. 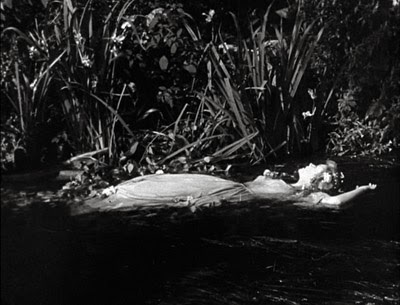 We then cut to a shot of the swampy stream under the weeping willow and, panning left, find Ophelia singing some songs normally in the previous scene. floating on a cushion of vines. She floats out of shot, vines trailing her for a while, and by the time the camera pans to where she would be, she's gone, swallowed up. As painless for the audience as it is for her. Fade to the next scene's tombstones. A rather efficient and fairly unambiguous scene then, though one could make the claim that we're seeing a product of Gertrude's or Laertes' imagination.